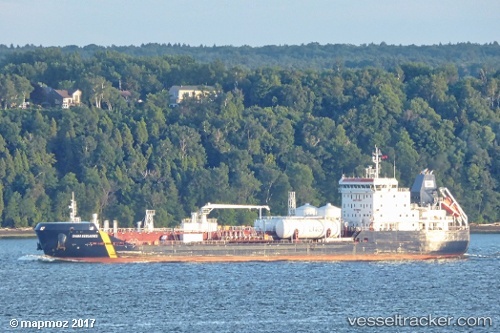 The "Damia Desgagnes" ran aground in the early afternoon June 16, 2017, at 3 a.m. on the St. Lawrence River east of the Iroquois Lock. The tanker was sailing upstream bound from Montreal to Nanticoke. The grounding occurred because of a mechanical issue and the ship was resting against the side of the channel. No pollution and no injuries. The vessel currently had one tug on station and another tug was en route. Once the second tug has arrived, they pulled the vessel back into the channel. Until then, vessel traffic had been halted on the Seaway. There was a higher water flow, but the grounding had nothing to do with the high water flows.